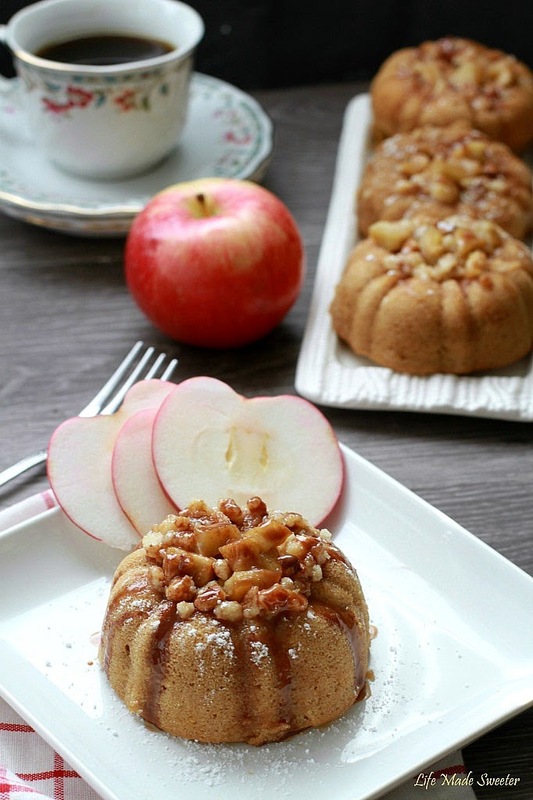 These elegant mini apple bundt cakes feature a sweet cream cheese filling topped with a buttery cinnamon streusel and apple pie filling. With a salted caramel drizzle, they are an ideal fall treat to go with your afternoon tea or coffee. You know what they say “about an apple a day”? Well in my house, we go through a lot more than an apple a day. My lil guy can easily eat two or three in one sitting so we usually have a ton of apples on hand for snacking and baking. I can’t think of anything sweeter than the aroma of baked apples and cinnamon filling through your house. 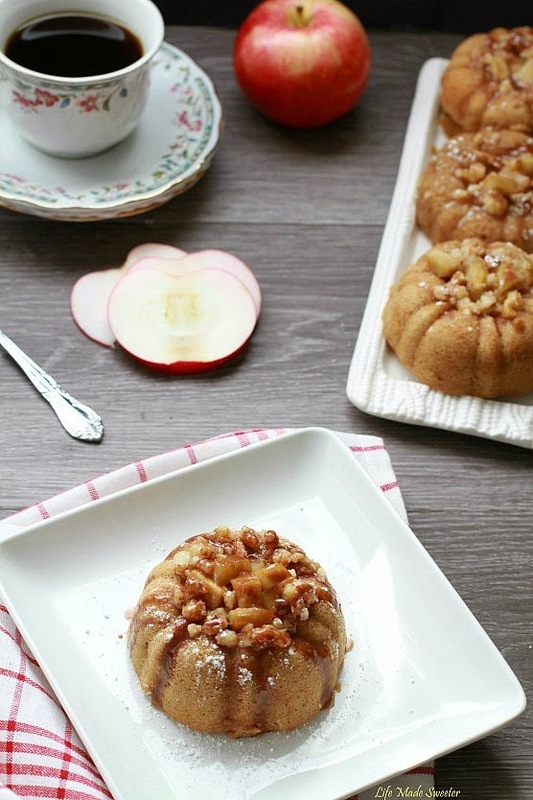 These apple streusel mini bundt cakes were the result of one of these baking sessions. They have all the classic flavors of fall in a mini single-serving portion. Because mini desserts = way cuter and so much more fun to eat. 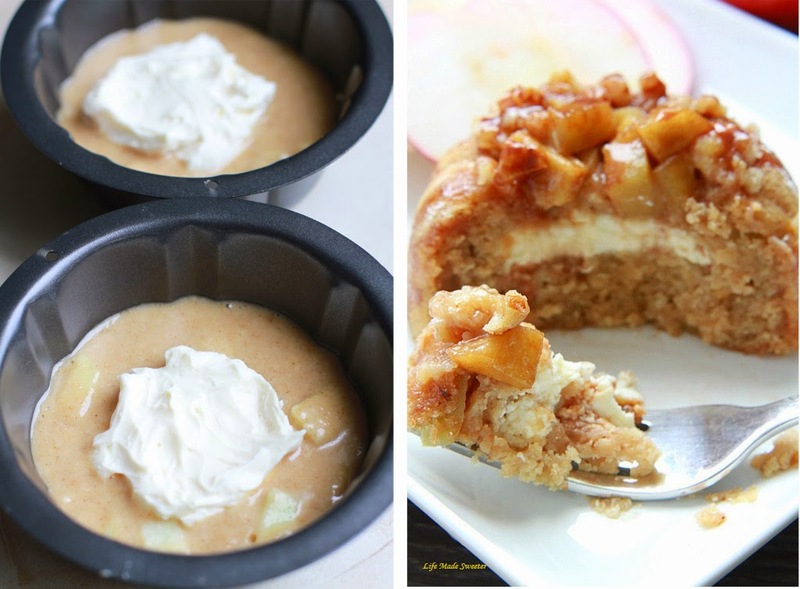 If you don’t have a mini bundt cake pan – you could always use a muffin tin or even a smaller cake pan. The cakes come together without having to pull out your mixer. I used Greek yogurt, coconut oil and apple sauce to keep them light and tender. The best part about mini desserts is you can have fun adding all of your own favorite toppings! I threw on a spoonful of homemade apple pie filling, some salted caramel and a dusting of powdered sugar. They are the perfect treat to go with your afternoon coffee or tea – one bite and you’ll fall in love! In a large bowl, add all ingredients and whisk to combine. Alternatively, mix with a hand mixer. Set aside. Preheat oven to 350 F. Spray your mini bundt pan, muffin tin or cake pan with non-stick baking spray. Using a large mixing bowl, whisk together the flour, baking powder, baking soda, cinnamon and apple pie spice. Set aside. In a separate large mixing bowl, whisk the egg, granulated sugar and brown sugar together until incorporated. Whisk in oil, applesauce, greek yogurt and vanilla extract and mix until fully combined. Add the flour mixture into the applesauce mixture and stir until evenly combined. Fold in diced apples. Pour the batter a third full into the prepared wells of the mini bundt pan. Dollop with a large spoonful (about 1-2 Tbs) of cream cheese filling smoothing the top lightly. Top remaining with cake bater and bake for about 20-22 minutes, or until a toothpick inserted in the center comes out clean. Meanwhile, make the streusel and the apple pie filling. In a small saucepan, melt butter on medium heat. Remove from heat and stir in the flour, sugar, cinnamon and salt with a fork until small clumps form. Return to medium heat and stir constantly until streusel is cooked to a nice toasty brown. Remove from heat and allow to set and cool. In a medium saucepan, place chopped apples, butter, brown sugar, lemon juice, cinnamon, and apple pie spice together. Cook over medium heat for about 3 to 5 minutes, until apples are tender. Stir occasionally. Allow mixture to cool. 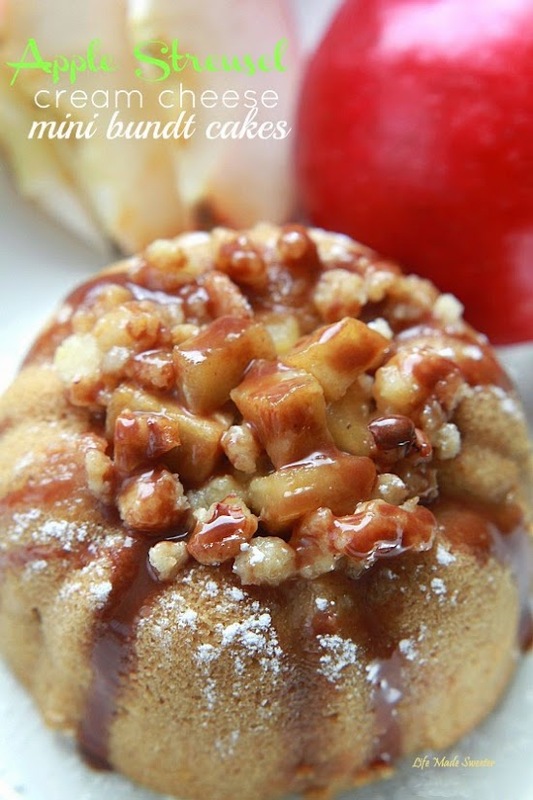 Top cooled bundt cakes with apple pie filling, streusel topping, salted caramel and a dusting of powdered sugar.